A British al-Qaeda activist who plotted atrocities in the UK and US has appealed against his life sentence. Lawyers for Dhiren Barot, 34, said he should not have been given a "whole life" sentence after pleading guilty to conspiracy to murder. Crown counsel said it would only have been a matter of time before Barot's plans, which included a "dirty bomb", caused serious "mayhem and injury". Three Court of Appeal judges reserved judgment to a later date. 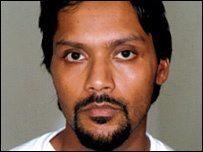 Barot was jailed for a minimum of 40 years by Mr Justice Butterfield at Woolwich Crown Court last November. Ian Macdonald QC said Barot should not have to spend the rest of his life in prison on a charge which would normally have attracted a fixed term of 20 or 30 years, less remission. Mr Macdonald addressed three appeal judges headed by Lord Phillips. He referred to recent comments by Lord Phillips that it was undesirable to keep old men in prison when they posed no continuing danger to the public. Defending the judge's sentencing principles, Edmund Lawson QC said even though Barot's plans had not been carried out they would have created "serious mayhem and injury and death to many thousands of people". There was no indication that Barot - a Muslim convert - had abandoned his Jihadist ideology, added Mr Lawson. "He was and he remains a terrorist," he said. Mr Justice Butterfield said Barot was a "determined, dedicated and highly dangerous" individual. The court heard that Barot planned terror acts including limousines packed with explosives and a radioactive "dirty bomb".